The Institute operates and thrives because of people like you who are part of a special group known as “Zoryan Friends.” Your financial support is the foundation upon which the Institute can fulfill its mission to research, analyze and educate, through publications and programs, about genocide and human rights abuses, the field of diaspora-homeland relations and the contemporary forces and factors that shape our reality. 2016: Wolfgang Gust, through his partnership with the Zoryan Institute, collected, restored and published documents from the German Foreign Office Archive. 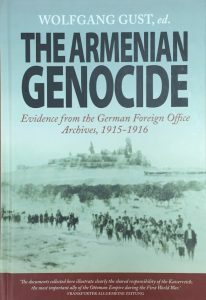 One of the Institute’s most groundbreaking achievements to date is supporting the editing, translation, and publication, in addition to financial sponsorship, of the book, “The Armenian Genocide: Evidence from the German Foreign Office Archives, 1915-1916. This extensive selection contains some 218 telegrams, letters and reports from German consular officials in the Ottoman Empire to the Foreign Office in Berlin describing the unfolding genocide of the Armenians. The material is unimpeachable by those who would deny the Armenian Genocide, as it is from Turkey’s own wartime ally. It provides researchers with a deeper understanding of the actions and the motives of the perpetrators of the Armenian Genocide. The Institute’s staff assisted with the publishing of the book in German (2005) and Turkish (2012) and the translation, editing and publication of the book in English (2014).